The weeks flew past and it was time to be leaving. A journey of two days and 1,100km saw us arrive at the ride base Sunday evening – a short statement for a long road trip full of its own adventures. 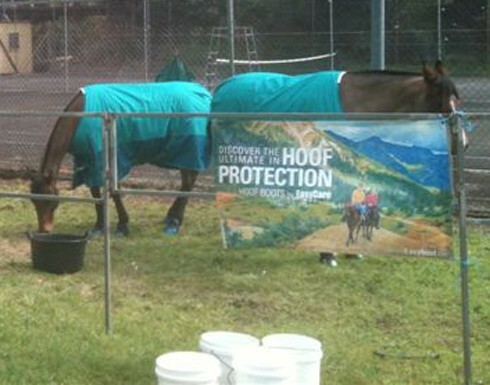 We unpacked, settled the horses in, and had an early night to be ready for pre-ride vetting the next day. The horses were entered and vetted through early Monday morning. 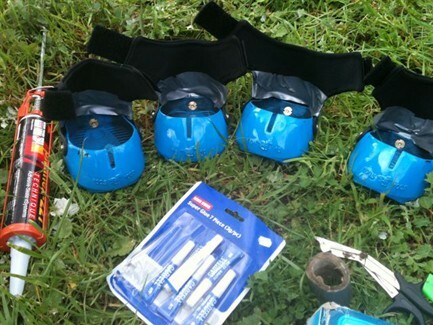 Then we glued their Easyboot Glove shells on straight afterward to allow a good time lapse for the glue to set before our 6:30am start the next day. After our previous ride at Kilmore we were fussier with our preparation. 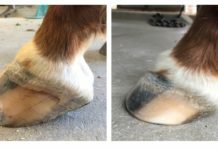 Each hoof wall and sole was thoroughly cleaned firstly with a dry wire brush, secondly with a wet scrubbing brush, towel-dried, then roughed up with the rasp for maximum cleanliness and adhesion between shell and hoof. 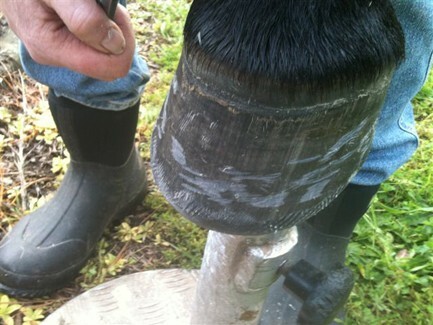 The gaiters will be unscrewed after the boots have been in place for a few hours. The duct tape on the inside was also removed – it was used to help prevent any sikaflex (you use Goober Glue in North America) oozing up and adhering to the gaiters. 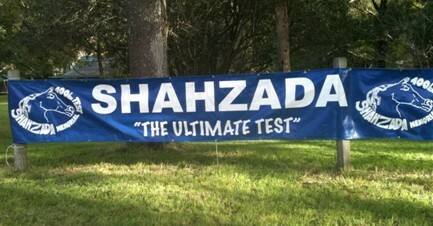 Many people have written lots of things about The Shahzada – its reputation as a ride has grown to mythical proportions – the funny thing is that most of it is true! We came with the attitude of having fun no matter what happened, without any pressure on ourselves because it was only three training rides. But to drive so far next time would require the much worthier purpose of the full five day/400km marathon. 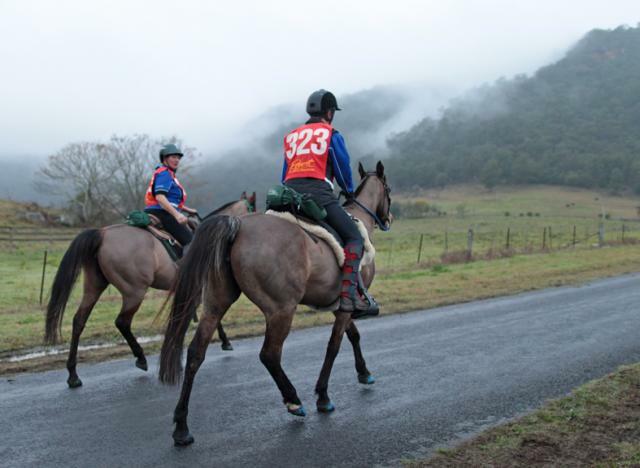 How we viewed the mini-marathon was unintentionally arrogant, and our opinions were revised before Day One ended, to become quite respectful of the track, the distance, and the achievement earned by riding and vetting through successfully. While still out on track on our first day we were already planning next year, what horses we’d bring, who we would entice to come along and share our pleasure in the riding. 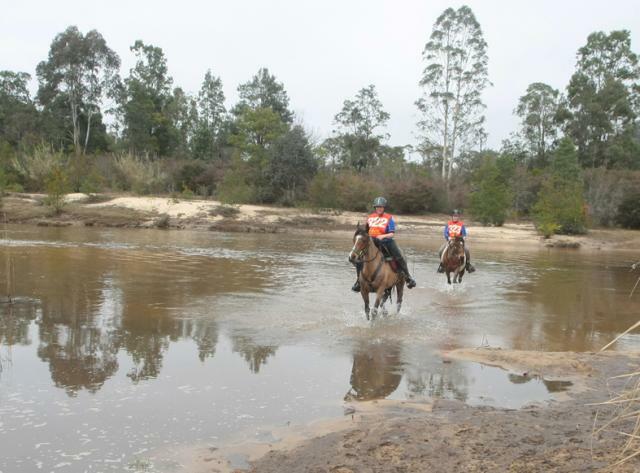 Having booted horses made it all that little bit easier – no worries about trotting down the hard roads, or whether we’d slip on the rocky mountain goat tracks or lose a shoe in the boggy sections. Back at base, we strapped the horses and presented for post-ride vetting Jenny’s horse Promise vetted through with flying colours. 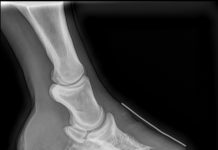 My horse Joby had a distinctly sore back and I was told that if I rode her in the same saddle for Day Two, then she would most likely vet out. I was given the advice of changing saddles, easier said then done when I didn’t have a spare saddle to use. It was suggested that I ask at the pre-ride briefing about borrowing someone else’s saddle – the vets were confident that I would get plenty of offers – they told me this is what the Shahzada spirit is about. Then an adjacent camper whose horse had vetted out pre-ride stepped forward offering the use of his saddle. It proved a good fit, resulting in Joby vetting through at the end of Day Two with a marginally improved back, so I was delighted to plan for Day Three which included The Steps! Not having a head for heights I was anticipating The Steps to be very challenging. The funny thing was that I was concentrating so hard on getting Joby down that I didn’t feel frightened at all. It was only when I arrived at the bottom that I realized that I had been completely terrified all along. 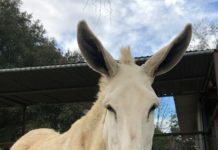 Not that anyone would guess to see the picture of me in the last few yards, skidding down on my backside with a mad grin plastered over my face. Jenny managed much more decorously by tailing Promise down, although Prom did have her own ideas of which direction to go at one stage, possibly trying to tell Jenny she was being silly to think that it was a real path she was expecting her to take. It’s much steeper than it looks and maybe I would have been better with Easyboot Gloves on my feet too! Jenny and I arrived as first-time mini-marathoners from interstate, and were made welcome. We felt quite distinctive, with our look-alike horses and our look-alike grins, and our state’s honor unofficially resting on our shoulders. We left as Shahzadians, already looking forward to next year’s special week in August when we’re allowed to come back and ride again. 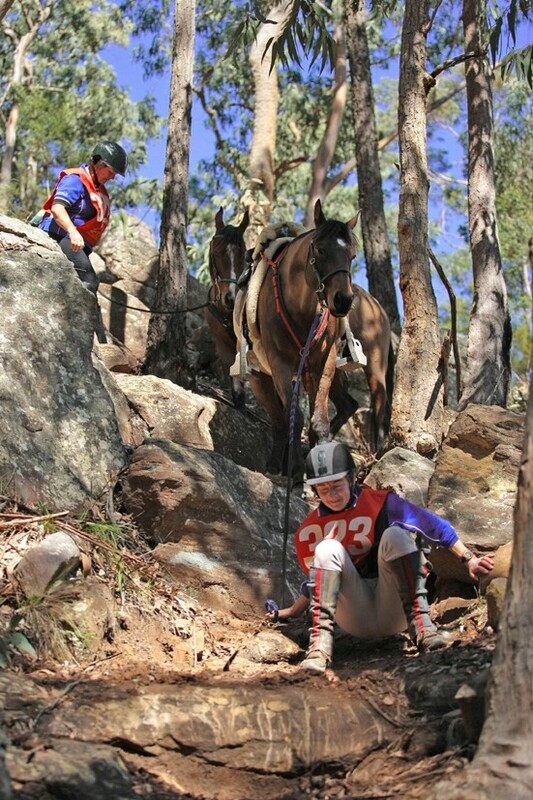 The Northern Convict Trail; Boyd’s Track; The Steps – they were all memorable parts of the ride. But the nightly pre/post-ride briefings where the camaraderie of the group showed, where as one big family each rider was celebrated even as they vetted out, where the slowest rider/s were given as much kudos as the faster ones – no jealously or pettiness or bad sportsmanship, each rider taking responsibility for riding to the conditions, the hazards, their horse: that is what shined through. We discovered as our adventure evolved, while riding was a huge part of the whole deal, we actually got to experience the very essence of Australia and learned that The Shahzada spirit is far more than just about riding.